but also through, normal social interchange. This interchange may or may not be named God by those involved in the interaction." It's available on Amazon here. To read the press release description, click here. Our friend Suzie Anderton produced this for us. She is an accomplished Second Life filmmaker and we were the beneficiaries of her generosity. She put this together before our new Worship Center was completed, but otherwise things are the same. Here's the link. Visit our Smaller Voices blog to read about the faith journeys of some of our members. YoYo Rez is our editor for this inspirational blog. Here is a link to it. Here is a video of the presentation of new churches at General Synod in Cleveland. We got a special shoutout! Here's the link. This link will take you to the site of the United Church of Christ. This link will take you to the site of the Southern California Nevada Conference. First UCC SL has been designated a ministry by the Southern California Nevada Conference. We are an Open and Affirming ministry. To learn what that means, visit the LGBT Coalition of the United Church of Christ site. You may also wish to read the Resolution we adopted to become an officially recognized Open and Affirming ministry. To learn about why virtual universes are vital to many who are dealing with gender and sexuality issues, have a look at this article by Cecilia D'Anasasio. Here is the Place to Start if You Are Not Yet a Resident in Second Life! To learn about Second Life, open a free account, and download their viewer software visit the Second Life site. Harper Ganesvoort is a photographer, designer and blogger. Her delightful blog will give you a great look at what is possible in Second Life! This is a must visit if you are interested in learning about the in-world experience. Click here to visit Around the Grid with Harper. Here is a video produced by Second Life. It's a promotion piece, but it also looks at the possibilities! Another very popular viewer for Second Life is provided by the Phoenix Firestorm Project. You can download the latest Firestorm Viewer at no charge. The people at Firestorm have also worked to be sure that there is help in learning to quickly and easily navigate Second Life. We like the Firestorm Viewer and here is a blog posting about following the Firestorm Viewer route into Second Life. There are dozens of tutorials about second life covering every aspect of living in the virtual world. This link will take you to the SL Tutorials site where you can browse and search for tutorials to answer your question. And here is a link to great help in "Getting Started in Second Life." For persons with physical limitations in real life, Second Life can be a terrific experience that can lead to real life improvement. Here is the opening paragraph of an article by professor Tom Boellstorff entitled "A (Virtual) World Without Parkinson's"
"Fran entered the Phantom of the Opera Masquerade Ball dressed to the nines. Her blue gown swayed with her effortless movements; her necklace glittered when it caught the light. She danced, song after song, never stumbling or faltering in her rhythm. It was a great evening, all occurring in the virtual world Second Life, where Fran often spends time with her friends." Read Professor Boellstorff's article here. Here's an article called "Persons With Disabilities Get a Second Life" that is well worth a read. Ciaran Laval has written a two part blog providing a general overview of this ministry. Our good friend Webspelunker Ghostraven has written about us several times. These posts will provide a perspective on the goals of this real church in a virtual world. Helping Others in Second Life VII - Will You Help a Child Go to School, Please? Does God Exist in Second Life? 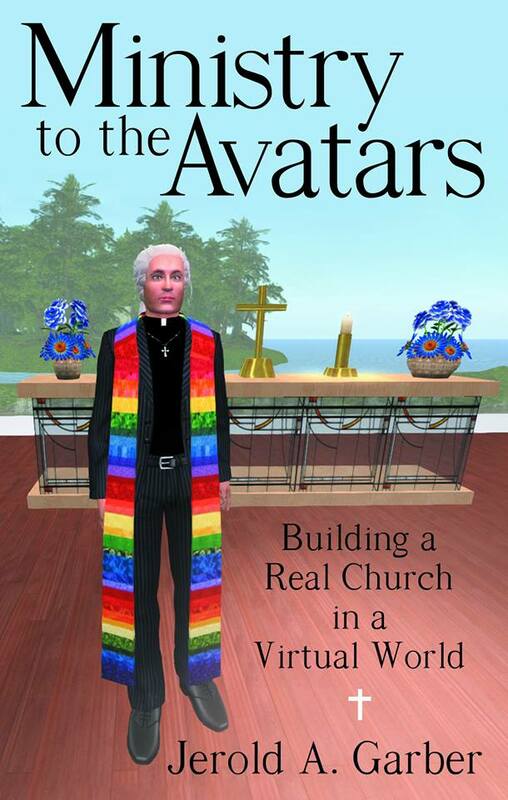 Here is a sampling to give you an idea of how others see this ministry in the virtual universe. Abinoam, another friend, did a blog post about First United Church of Christ, SL in April 2014. Here is an amusing article based on an interview that included Philip Rosedale the creator of Second Life. It's from the Religion and Ethics Newsweekly and you can read it here. The Washington Post did an article called "Finding Religion in Second life's Virtual Universe." It's a few years old but provides some interesting background. Here is another video that provides a look at some of the services that were discovered by a group that I believe probably did the video for a college media class of some sort. It's interesting because it gives a view of what is being done in the major world religions in-world. Our approach will be unique in several respects, but this will give a picture of what is occurring. There is interest in finding services in Second Life. This link will take you to the Second Life site General Discussions religion thread. Staff member YoYo Rez is a terrific writer and her blog is really worth a visit. Pastor Josh is always fun to read. Check out his blog. The National Committee for Innovation, Technology and the Local Church blog is here. Here is a link to a white paper that details the project concept. Ministry Opportunities in the Virtual World. Here is a message to our Friends and Members explaining how we determine official members in Second Life. It is a text file as used in Second Life. Here's a link that decries the kind of discrimination and non-accepting behavior that we associate with the real world, but that occurs in the virtual world as well. We hope to add our collective voices to acceptance of everyone, no matter who they are or in what world they may be journeying. If you find an interesting link, please let us know! We'd love to share it.